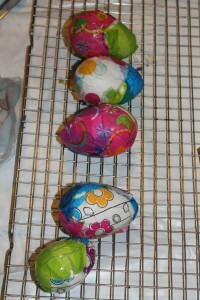 Decorating Easter Eggs doesn’t have to just be about dyeing them. 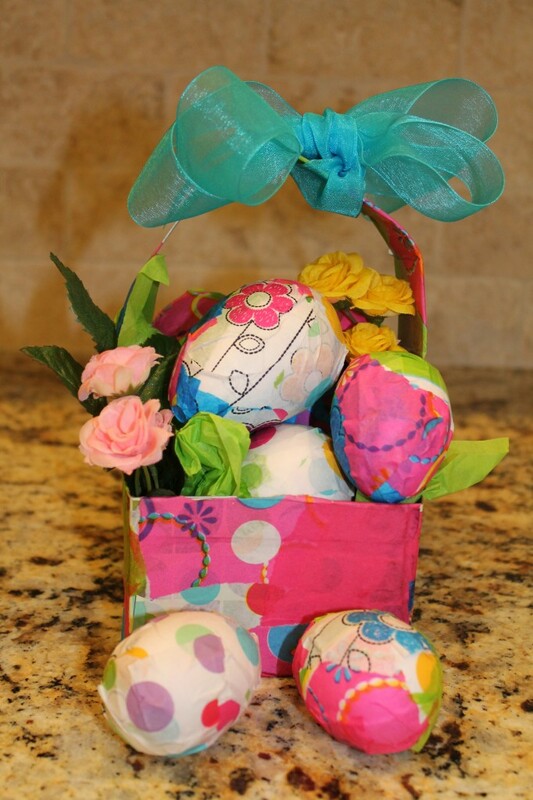 Check out these cute papier mache decorated eggs that will delight all ages! This idea was inspired by favecrafts.com. How cute is this look as a table center piece or a gift for grandma and grandpa? Styrofoam eggs (you could easily use real eggs that have been hollowed out and dried as well.) We used two different sizes. Tear tissue paper into small pieces, about 2 to 3 inches, any shape. Mix one part glue with two parts water in a bowl. Spread waxed paper or a plastic tablecloth onto your work area. Dip tissue paper into glue mixture, allow extra to drip back into bowl or squeeze off with fingers. 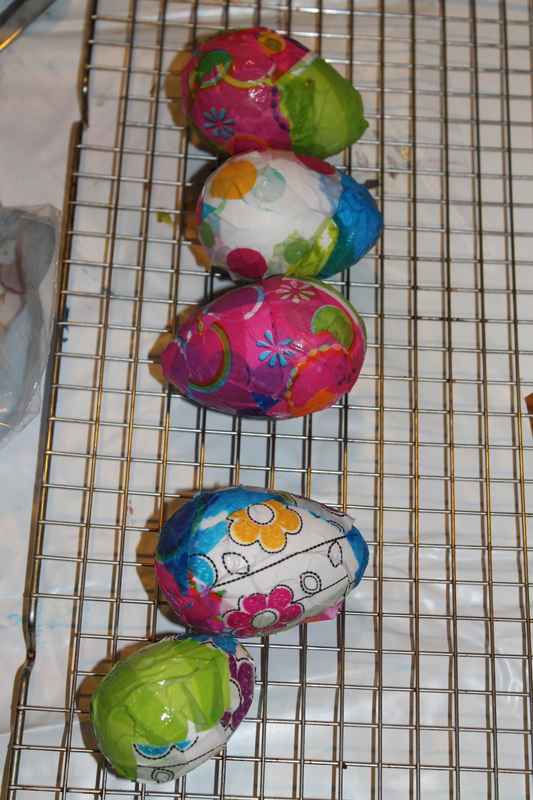 This part is messy but fun; use the paper towels to clean up in between eggs as needed. Layer tissue on egg until you have the desired effect. It did not take a lot of paper per egg. Place eggs on the wire rack to dry. Allow to dry overnight. Don’t let eggs touch each other or they will stick together. For the tissue box basket, cut the bottom 2/3 of the box off to make a square. You can use the top part of the box to cut a 1 1/2′ wide handle. Once the pieces are covered with papier mache and dried completely, glue the handle to the inside of the box. Add some green tissue inside the box and and a few artificial pink and yellow roses plus a bright ribbon. *Note: Thicker, decorative tissue works better than the traditional thin layers. If you use thin layers, they may work better if you use several layers together at the same time.